HG's De-Pudged Pigs in a Blanket! Preheat oven to 375 degrees. Cut hot dog into 4 even pieces. Stretch or roll out the triangle-shaped dough slightly, to make it a larger triangle. Cut dough into 4 long, narrow triangles. Beginning at the base of each triangle, roll a piece of the hot dog up in the dough until the point of each triangle wraps around the center. Place dogs on an ungreased baking pan and cook for about 12 minutes (until dough appears slightly browned and crispy). Enjoy! 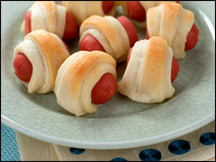 Cute little mini franks wrapped up in fluffy, buttery, doughy blankets can be hard to resist, whether you're strolling through the supermarket or making rounds at a cocktail party (oh, don't act like you've never stalked the waiter carrying that tray -- we've all been there). They're so cute and tiny -- how bad can they be, right? You'd be surprised. They pack in some serious fat and calories! What a waste when with just 2 ingredients and a few minutes, you can whip up your very own guilt-free version at home: HG's De-Pudged Pigs in a Blanket. Go hog wild! 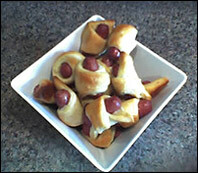 Today, April 24th, is National Pigs in a Blanket Day. Now you know how to celebrate. Yay! Don't be a recipe hog. Share this email with friends, family members and some random acquaintances, too. Click "send to a friend" NOW!